Here is the thread for the Steampunk visit to Ipswich on the 19th of February. While the gathering is intended as the first meeting of an Essex Steampunk group, (Yes, I know that it is in Suffolk.) All are welcome. which has a splendid Victorian Natural history hall. And, I believe, A Woolly Mammoth. We plan to meet for a meal first at the Mariners Restaurant. Which is an 1899 Belgian Gunboat converted into a restaurant. So far the morning is free, so If anybody has any ideas, I am open to suggestions. The restaurant is closed until 1st of February. We will probably have to book a table, as we are expecting a reasonably large turnout So, could anybody who wishes to join us, please either post their interest here, or contact me by personal message, and let me know wether ir not they intend to join us for the meal. Proposed itinery for the day. 12.30pm Proceed to the Mariners Resturant. AFTER MEAL, Walk to the Ipswich Museum. 5.00pm Libations, and a light supper at the Cricketers pub. Between 8.00pm & 9.30pm, Set off to Club Incarnate in time for Ghostfire live performance. Mark ? Yes Yes ? Jen ? Yes Yes ? Unfortunately, The Ghostfire performance has been cancelled. Thank you very much for organising this event and for teasing the threads apart, Mr. Addams. I would like to provisionally offer my RSVP of attendance and that of my partner, Ambrose Booth. I got a telephone call from the Mariners Restaurant (EARLY) this morning. We now have a table booked. I am told that we can reserve a table of up to 80. So, for the time being, I shall be working on the assumption that the deadline for numbers for booking the table is the 12th of February. Also, I have had three more conformations of attendance. Greg and I will be attending (Mark is also showing an interest - have said I will pick him up) so likely there will be 2 possibly 3 - my good man ! This is BIZARRE... about an hour ago, I was looking up gigs on Ghostfire's website and it turns out they're playing IN IPSWITCH on the 19th (my birthday weekend.) I was just thinking "do we have an excuse to go to Ispwitch that day/weekend?" Edit: We won't be able to make it this time there are events going on that weekend in Worcester (now the date has been changed to avoid conflict with the RSC costume sale). However, please consider my interest registered for future events, as it is shaping up wonderfully, and in the meantime I'll see if I can get Ghostfire to play a bit nearer to us. It is My birthday Weekend Too. I had no Idea that Ghostfire were playing at the Corn Exchange. That would be the perfect end to a perfect day! I shall be in Ipswich that weekend and would be delighted to attend meal, museum and Ghostfire. (Just me for the moment). Ghostfire at the Corn Exchange eh? Well I never! "The formula 'Two and two make five' is not without its attractions." WooHoot! We are now looking into tickets for Ghostfire too. Now to discover some centralised parking to all three venues. Tickets are not yet available, or even being advertised, for the event at the Corn Exchange. I shall keep you posted if I get any more news. What serendipity! 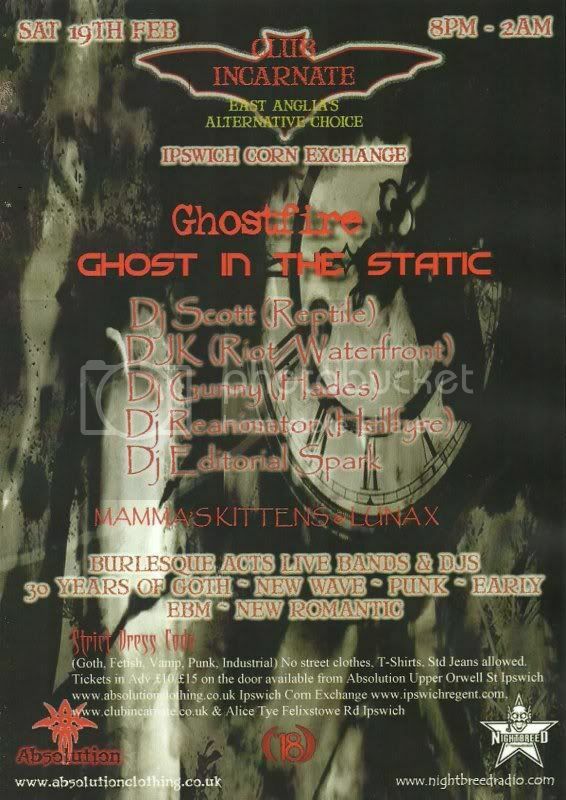 How did this event manage to get organised for the very day of the Goth club with Ghostfire performing? Someone has psychic powers? Sounds like a grand day out. I just got off the telephone with the organiser. They do not have any information available at the moment. But they promise to email me more, when it becomes available. The Doors open at 8:00pm, but it is not likley at this stage that Ghostfire will be on until late. Moviing the meal to the evening would kill a bit of time, bit it would add £10.00 to the cost of the menu, and I am not sure what time they start serving, so I am reluctant to suggest it. A pub that offers a light Menu would probably be the best option. Calliope and I would be happy with your suggestion Mr Addams, stick with the lunchtime at the Mariners and while away some time in a pub before "Club Incarnate" and Ghostfire. We've decided we'll book a hotel for the night so we can stay 'til the early hours and the driver (me) can drink! Calliope may need a rest period at the hotel in between activities. We will be socialising with Captain Dirigible and his good lady tomorrow evening and will discuss with them this outing. Ipswich is one of our regular 'haunts' and if there is a gap between the museum, lunch and the evening's entertainment we may find time to pop along to the Steamboat for some Old Speckled Hen. Assuming, of course, that our party are all in agreement, interested and available. After searching out the 'Incarnate' club night, which is the event at which Ghostfire will be playing, I have found the other band that will be performing that night. I actually put on an EBM/Metal night in a two roomed venue a few years ago. I am most intrigued to see who may be attending this one as I've been somewhat out of the loop for a while. Burlesque indeed...totally outrageous haha! Parking is a bit of a pain here I'm afraid. There are various car parks around however including a multi storey close (ish) to the town centre. Christchurch Park is fairly near to the Museum. I shall of course be very happy to attend this event, and act as your "Indian guide" as it were if required. Ghost Fire - Wow, had never heard of the - looked at video and they seem pretty good ! As my better half said, life is a school every day - ie learn something new !! Parking in Ipwich is pretty dire - unfortunately the multi storey by the museum is no more - they pulled it down last year !! however, a smaller car park is there now, but obviously with fewer places. But it is well placed for the Museum it being just a few steps away ! Depends on the regular saturday shoppers who will park there as it is convient for the town. Think the suggestion to keep the main meal at lunch time is better with a light supper later and a speckled hen! Now that I have a few suggestions of pubs, I shall try to organize a Reconnaissance Trip to Ipswich over the next week to look at the possibilities. re the parking... There is the Ipswich Park and Ride but the last bus doesn't appear to run very late. See PDF of car parking and tariffs. I am liking both Ghost fire and Ghost in the Static and am getting excited about this event. There's no details on stage times yet. We don't know ourselves what time we're on, though I've emailed the organisers to find out and will post here immediately I know. Just to add to the bizarreness of all this - it's my birthday on Feb 20th and also the birthday of Rob, our keys player. I think there will be a large number of us celebrating at this thing! This should be good actually. New events tend to be checked out for novelty value if nothing else so attendance should be reasonable. Nothing of this nature has been held at the Corn Exchange for quite a while now. And certainly nothing even vaguely steampunk related anywhere ever to the best of my knowlege. I received two emails this morning which pretty much give me all the information I need to put the day together. Firstly, I had a message from the Mariners Resturant, informing me that it opens for lunch at 12:00. A good meal can fill quite a long time, and it will take about half an hour to walk the 1 mile to the resturant. Is 12:Noon to early to start lunch? It all depends on how much time we want to spend at the Museum. Secondly, I got an email from the Club incarnate. Hi sorry for short delay, but I am sure you appreciate we needed time to get over Saturday. Club Incarnate as you know is to be held on 19th February at the Ipswich Corn Exchange, doors opening at 8p.m. and finishing at 2a.m. club Incarnate is an alternative club encompassing more than one genre, on the nlght in question we have four DJ's, two bands and a burlesque cabaret. Each DJ plays a different style the night will include 1 x Punk/New wave; 1 x Electro/EBM/New Romantic 1 x Goth/Goth inspired and 1x classics of all three genres. The bands are as you know Ghostfire and Ghost in the Static. the chill out means if you don't like a particular genre you can sit it out with out having to lose the atmosphere. We also have available a changing room for the public to use if they so require. Due to the coincidence of both happening on the same day I am sure if needed we could come up with something to help cover the gap between one event finishing and one starting. I am not sure if we want to take Tim up on his offer of help to "cover the gap between one event finishing and one starting." Personally I would prefer a light supper at a pub, this would allow us to take our time before going to the club, instead of havingto turn up at 8 on the dot. Apparently the live section of the evening is between 10.pm and 12 Midnight. They also sent me a copy of the flyer for the event, but it is about A3 size, so I shall need to resize it before I can post it, I will probably get round to that tomorrow. The only thing left now,is to find a suitable pub for the early evening. As Rockula already suggested, the aptly named Steamboat isn't too far from the Mariners. And it does do good Ales and food. It's just a bit of a yomp back into town that's all, but it's doable. McGintys is closer and the Swan is opposite. The Dove is up the road a little ways and does the best ales. I'm not quite sure what they'd make of us though haha, but it's normally ok.
One thing that I forgot to mention. Tickets are available online for £10:00 advance price (£15.00 on the door.) at the Club Incarnate Website. They should also be available from the Absolution Clothing Website, Which is now listing the tickets for 19th of February for sale. We now have a stage time for Ghostfire. We're on at 10pm. I got this changed from 11.15pm because I thought it was too late for you guys, and probably for us as well. This will obviously affect your early evening plans, but I think it's a more manageable time all round. Mr Addams has already posted the relevant website details for ticketing, and they've been updated now to reflect the Feb 19th event. Actually, if the pub you choose is not too far from the venue we might well join you for some drinks, since we'll have a LOT of time to kill on the day. Page created in 0.282 seconds with 17 queries.